THERE ARE A FEW OPPORTUNITIES FOR DOUBLING, IF DESIRED. "THE PRINCIPAL SETTING IS SKELETON ISLAND. THE TIME IS ANYTIME AFTER THE BATTLE. ANYTIME WHEN THE STORY OF TREASURE ISLAND MIGHT BE TOLD. THE ACTION OF THE PLAY WILL TAKE PLACE IN VARIOUS PARTS OF THE THEATRE. THE STAGE AREA SHOULD INCLUDE THE ISLAND'S STOCKADE, A STURDY FORTRESS WHERE SMOLLETT'S CREW TAKES COVER; AND SOME ROCKS AND SAND AND TREES, IN THE MIDDLE OF WHICH, EVENTUALLY, SILVER AND HIS CREW WILL SEARCH FOR THE TREASURE. THE STORY WILL BE ACCOMMODATED LATER ON BY THE MANIFESTATION OF THE BOW OF THE SHIP "HISPANIOLA," WHICH CAN BE REPRESENTED BY A SMALL PLAYING AREA, WITH, PERHAPS, A SAIL, AND CERTAINLY A PLACE TO FLY THE UNION JACK. THE PORTION OF THE SHIP WHICH WILL BE IN VIEW MAY BE ROLLED ON DURING THE SHOW, AND THEN SECURED. 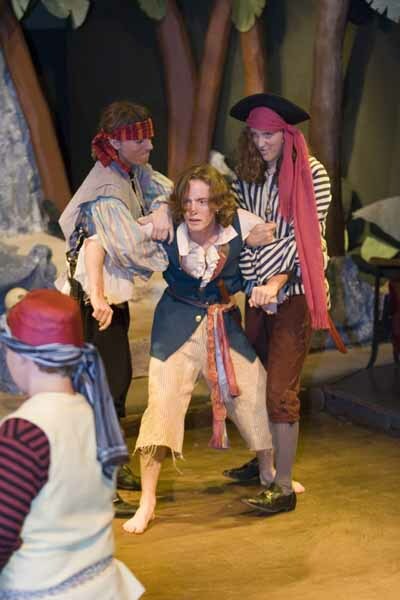 THERE SHOULD BE A NEUTRAL AREA ONSTAGE TO ACCOMMODATE SCENES AT THE "ADMIRAL BENBOW INN," AND THE SEAPORT OF BRISTOL.THIS PLAY, FOR THE MOST PART, WILL TAKE PLACE IN THE MEMORY OF BEN GUNN. AS HE RELATES WHAT HE REMEMBERS, THE VARIOUS LOCALES WILL COME TO LIFE."